Good-bye and thanx, FRIDGE !! My fridge was broken this summer. It kept on working over 10 years. I thanked it and made this page. 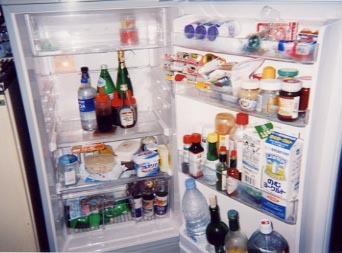 The right is contents of the new fridge. Milk, yoghurt drink (plain and blueberry flavor), German wine, French wine, wine I don't know, woolong tea, evian, s.pelegrino, perrier, Japanese soda, canned juice, Japanese apricot syrup, maple syrup, coffee syrup, soy sause, butter, yoghurt, tofu, garlic, clam, miso, dried shiitake, oyster sauce, lemon juice, peanuts sauce, Pepper sauce, Jalapeño sauce, fish sauce, shrimp paste, feta, mustard, Chinese pepper sauce, basil paste etc. 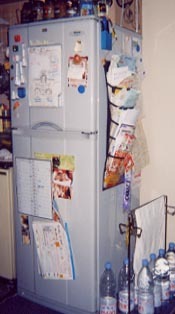 I (and my room pal) hurried to buy a new fridge at that time... it was hot, icecream changed into mousse, frozen vegetables melted and we didn't have enough fand. 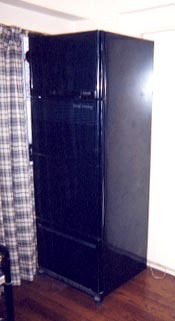 When I took the photos of fridges, I also took photos of other things in my house. We take off shoes here 'cause we live in Japan. 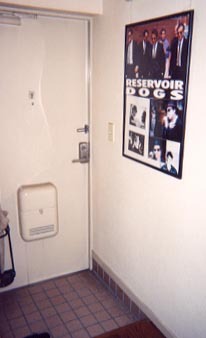 You can see a poster of "Reservoir Dogs" and photos of "The Blues Brothers". These are my fav. I like men who wear black suits. 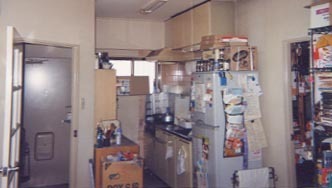 It's very small kitchen. I cook here... sometimes. Is there something strange? 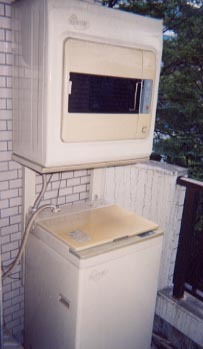 This is a washing machine and a dryer. I think they're dying now. When I wash heavy cloths like jeans, the washing machine dances with a terrible noise. I spend almost of time here. 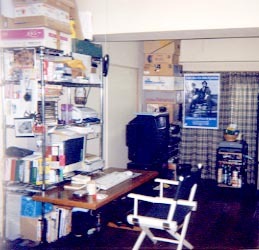 You can see a poster of "BB" and understand how I like the movie. Maybe you wonder why there are many paper boxes in the room. The reason is ... a secret. This is my TV set (32 in.). 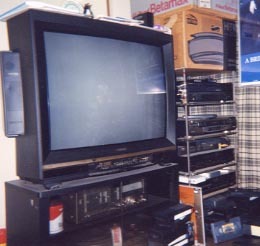 An old cassette player, an old vinyl player, 2 VHS video players, a beta video player, a LD player, a selector and video tapesssssss. And a penguin on the TV set. 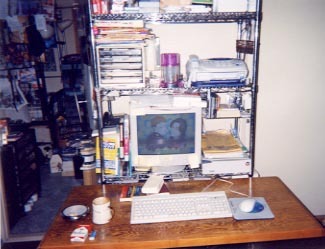 These are my PC, my dictionaries, my mug, my ash tray, my Marllboro and our fax. I use my drawing of Diego & Massimo as a screen saver. 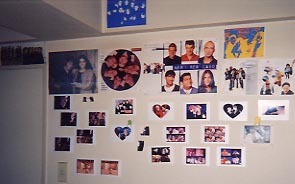 This is a wall opposite side of the PC. There pictures show OUR madness. NPC, Ridillo, Take That, "Crash", "Reservoir Dogs" and Miminya (a cute cat-like monster from a game "Monster Farm" of Play Station). 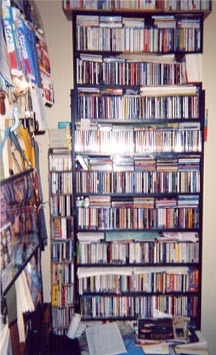 This is my CD shelf. Of course there are my CDs anywhere in my house. 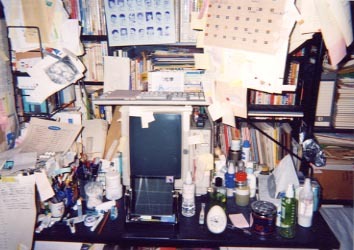 The left side of the desk is... book shelfs. 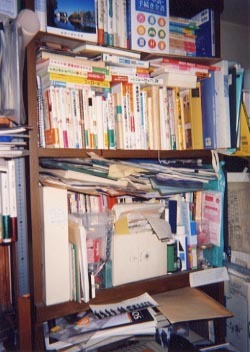 On this shelf there are books about Italy and Italian, scores, a B/W laser printer... and paper!! 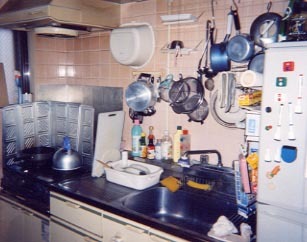 We have 3 rooms except the living room, the kitchen, a bathroom and a lavatory. But we are 2 persons. So, the extra room was at first for a guest. 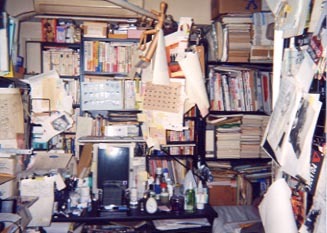 But now, the room is our library and my clothespress. 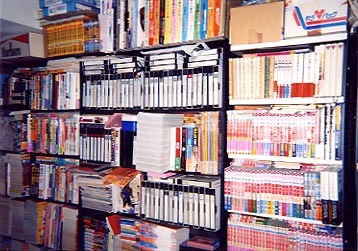 There are bookssssss, comicssssssssssssss, video tapesssssssssssssss, LDssssss, cassette tapessss and vinylss in the room. Ah, and my clothes. Aaaand paper boxesssssssssssssss. A guest who come to our house can't sleep here anymore. Well, how many NPC's photos, drawings or copies could you find?